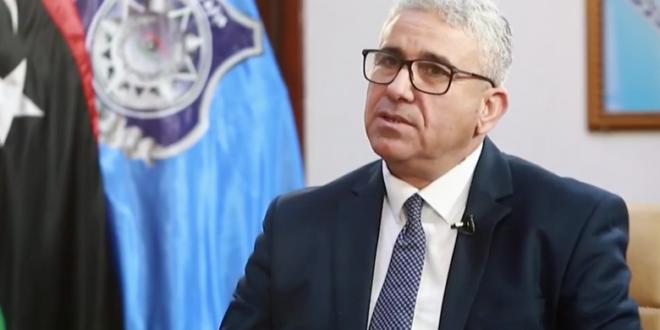 The Interior Minister of the Presidential Council's government Fathi Bashagha has accused the UAE of sending Khalifa Haftar military support for his war on Tripoli in a clear violation of the international law. Bashagha told Alhurra TV Channel on Friday that they received information about an aircraft that came from UAE and landed in Benghazi's Benina Airport with military equipment for Haftar's forces in violation of the UN arms embargo. He called on Egypt and Saudi Arabia to support Libyans not the individual named Haftar as betting on a person rather than the entire people is a losing bet. "Our forces in Tripoli will turn from defense to offense to foil the advance of the attacking forces and push them to their previous positions." Bashagha remarked. He said his government regards Haftar as an illegitimate party and his forces as militias, and those who think he has built an army are delusional as the only Libyan army can be formed just when the constitution is approved. "How can a national army attack a city of it's own country." He asked, denying any talks with Haftar saying "we don't negotiate with a warlord." "A ceasefire can take place only if Haftar's forces withdrew to their previous positions. Then we can have a dialogue with eastern elders and tribes; those who care for the wellbeing of the country as a whole." Bashagha explained. He also said that the captured fighters from Haftar's forces are being treated well and they will be set free to return home soon.